Well, it was one of those afternoons. I picked Mark up from school and he immediately starts in with me. His friend Freddie came to school bragging about a rifle his father had bought for him. So that’s what I was listening to on our way into town. The fac t that I had already said no seemed to mean nothing. I was getting upset with him, but it didn’t seem to faze him any today! “Please pa!” he begged me again. “I said no!” My voice was getting edgy, and that should have been warning enough. “Why not? Freddie’s father got one for him!” Mark declared. I lost count of how many times he asked why. Finally, I simply answered, “Because I said so! Now stop it.” I tied the reins to the hitching post. “I wouldn’t have to shoot it,” Mark tried to bargain with me. Mark knew the subject was closed. He took the papers from my hand and slowly walked into the bank. I smiled and shook my head as he left. When I walked into the bank, I could tell something was wrong. Apparently my neighbor, Rumson, had sold his ranch to an unknown person and no one knew who. Curge Palmer was very upset, because he had made an offer on that ranch, but was turned down. He was outbid by $1,000.00. Curge came over to me and started complaining about the ranch being sold out from under him. He wondered who the new owners were. “Sheep people maybe!” he declared. “I’ll trim a tree with that Rumson when I catch up to him! Selling out to a Pepper Gut!” Curge declared. Curge kept complaining and calling them Pepper Guts. I didn’t appreciate my son hearing such words, so I sent him outside, not realizing that the damage had already been done. I wanted to try to calm Curge down and stay and make sure there was no problem for the new owner. Curge commented that my ranch was probably sellable for about half what it was ten minutes ago. I smiled and stated that I wasn’t planning to sell. Mark went outside. He saw another Argentina man sitting on a horse. Mark and some other children stood outside staring at him. “What are you all dressed up for?” he asked the man. Needless to say, I was shocked. “Mark!” I shouted. I couldn’t even think of anything nice to say to him, so I said his name again. I was very embarrassed and disappointed in him! I turned and apologized to the gaucho on the horse. He simply excused Mark stating that he was just a boy. “He’s a boy who knows better!” I stated harshly as I pushed Mark in the direction of the horses. Curge couldn’t help making fun of the young Gaucho on the horse either. This one wasn’t as nice and drew a knife on him. Curge started to draw his gun, but I stopped him reminding him to use his head. Then I introduced myself to my new neighbors. Needless to say, Mark was in trouble. He was still upset about getting in trouble later that night when he was at the table doing his homework. There was still an unusual silence lurking between us. I was on the porch cleaning my rifle. Mark looked up from his homework at me. I turned and looked at him. That’s when I decided it was time for us to have another talk, only this time I would be calmer. I put my gun in it’s holder and walked over to him. “Mark, what’s a gooch?” I asked him. That answer wasn’t good enough for me. “Well, you thought it was pretty funny in town today,” I stated and waited for him to give me an acceptable answer. “Well, it’s what that lady said when I asked about-“ Mark started. He knew he had been wrong and didn’t want to talk about it. “-about why that man was dressed so funny.” Mark answered. “No, I’m not angry,” I assured him. But he knew I wasn’t happy either. I knew he was sorry for getting into trouble, but I wasn’t so sure he was sorry because it was wrong. “I suppose you are, son. But what are you sorry about?” I asked as I reached out and touched him. I knew he needed to learn a lesson. “Cows are cows!” Manolo declared. His daughter spoke up and stated they did know why, and they were selfishly pleased. I figured they knew why. Manolo told his father he would not ride with my son. His father simply stopped him and told him he would ride with Mark. “What will your son say when you tell him?” he asked. “He’ll say no,” I answered without hesitation. “But he’ll be here. Tomorrow.” I promised. “You can go fishing with Freddie some other time. Tomorrow, you’ll ride with Manolo!” Mark wasn’t happy, but he knew better than to disobey my orders. I couldn’t help but smile as I walked out the door. Mark shows up as ordered the next afternoon. I ride out just to make sure he does indeed follow my orders and doesn’t give Manolo any trouble. The gaucho is anxious to show Mark his prowess and skill with a different set of ranching tools. Manolo immediately shows him the bolos. He swings them around and ropes a calf with them. Mark is so impressed as he watches that he rides off excitedly to see more of this. I smile as I watch. Yep, my boy is fitting right in! While he and Mar k are out on the range, trouble starts to brew immediately. Manolo sees his sister riding with Ned Dunnell. They look happy. Manolo isn’t happy about this. Later in the evening, Ned Dunnell, escorts Nita, home. It’s obvious that they have started courting already. She gives him a smile and they kiss. Manolo sees the whole thing. He meets Ned on the porch after Nita goes inside. Manolo tells Ned to leave and never come back. Ned tells Manolo he’d see him later in Spanish. He doesn’t want his sister courting a gringo! When Ned starts to argue, Manolo pulls out a knife and threatens him. “When I’m not wanted here, Miss Nita will be the one to tell me. In the mean time, I’ll continue to see her,” Ned states before leaving. After he leaves, Nita comes out to ask Manolo what he had been doing. She knew he had threatened Ned. Their father shows up and stops their arguing. Apparently, Manolo was nothing but trouble and was a disappointment to the family! Mark and Manolo continue meeting after school. Mark is getting really good with the bolos, and they agree that they are friends. One night, I have another talk with Mark. I state that I hadn’t seen Freddie around. “Oh, Freddie!” he groans. I point out that he can’t abandon the rest of his friends just because he made a new friend. Apparently, Mark wasn’t in the mood for one of my lectures, because he announces that Manolo was going to show him the heavy bolos the next day. The next day, Mark and Manolo are in town when Manolo shows Mark the heavy bolos. He tells Mark that one blow could crush a man’s skull. Mark wants to see what they can do so Manolo demonstrates them by throwing them at a crate. They bust the crate to pieces. Mark is impressed and wants to try, but Manolo states that those are a killing thing. Unbeknownst to them, Curge Palmer is there watching the whole thing. Later that night, Ned is murdered while on his way to see Nita. I rode into town the next day and see a mob forming. Micah is trying to calm them down. I saw a body slumped over the saddle of a horse and ride up to the group to see who it was. Micah states that it was Ned. Curge Palmer wasted no time when I asked if anyone had any ideas what happened. “Ideas nothing! We know! Ned was sweet on that Pepper gut girl, but he got chased by that squirt that your kid hangs around with. I saw him with your boy right down there a twirling those things that could bash a man’s head in just the way Ned’s is!” He wanted to go get him. We all knew if he did that, he wouldn’t come back alive. I could see where this was going. I also knew Mark was with him. Mark was more important than anything else at the moment. “Micah, Manolo’s out riding the range with Mark. Is it all right with you if I go out and try to talk him into coming in by himself? I don’t want my boy in the mid dle of any gun play!” I declared. Of course, I wasn’t really giving him a choice and Micah told me I could. So I rode out to talk to Manolo. “Sorry, Manolo, you’ll have to come into town with me.” I stated. Of course, he wanted to know why. “Ned Dunnell has been murdered.” He seemed surprised that he was being accused. “If you’re innocent, you’ve got nothing to fear.” Mark looked so confused. He couldn’t believe his friend could do anything like this! Manolo was even able to guess who accused him. “I do not think I wish this man to be my judge!” he declared. “Well, I’m not exactly. But it would be better if you came with me. I’ve told you, nothing will happen if you’re innocent,” I promised him. “Innocent till proven guilty, yes!” I promised. He let them go, trying to hit me. I lifted my gun and ducked, avoiding them from hitting me in the face. Then Manolo got out his knife and started towards me. I was on the ground, so I lifted my feet to keep him from stabbing me. He flipped over me and rolled on the ground. Then he was still. Mark stood there watching the whole thing! I ran over to Manolo to see that the knife had killed him. He had accidentally stabbed himself right in the chest. Mark saw it and ran to his horse. I turned and watched Mark ride away. My heart ached for him. This is not something I ever wanted him to see! I wanted nothing more than to run after him, but I had to deal with this family first. His words do something to me. I want to go to him – to hug him. But this was a hard truth he had to face. “If I did son, I didn’t explain it right. They are people like anyone else, no better, good and bad. There’s always an unfortunate like Manolo, and there’s always a Curge Palmer. I know that’s an awful grown up thought for a ten year old, but I’d like you to try and understand.” I sad sadly. Mark was surprised. But I think he knew that I was doing it more to make him happy than because it was the right thing to do. Sometimes your own children can act more grown up than we adults do! Mark swallowed. “Pa, I’ve been thinkin’. Maybe I better wait a while. Till I get older for the rifle. I’ll appreciate it more than.” He started crying again. My boy was so grown up. I wanted to burst out crying but held back my tears. All I could do was show him I loved him. “Anything you say, son,” I choked out. Then we started walking inside…arm-in-arm. 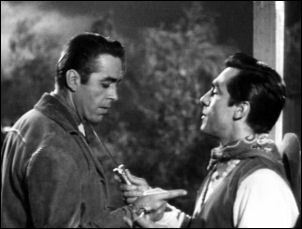 piddlin' stuff.....Perry Lopez played Manolo Argentez. He's guy that Mark thought was different, the one Lucas wanted Mark to spend time with. Lawrence Dobkin appeared in four episodes ― The Gaucho as Juan Argentez, the Gaucho's father ― The Sheridan Story as General Phil Sheridan ― Knight Errant as Don Chimera del Laredo, he was the guy with the sword ― The Day a Town Slept as Ben Judson, the man who beat Micah in the election for Marshal of North Fork. 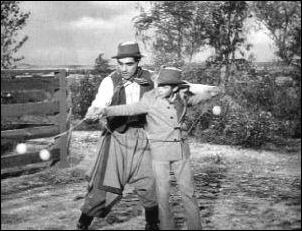 Chana Eden was Nita Argentez, she was the sister of The Gaucho. Dennis Cross appeared in six episodes ― The Safe Guard as Witcherly ― The Gaucho as Ned Dunnell, he was killed by Manolo for like his sister - The Hero as Dorn, the gunslinger in charge ― The Vision as Fance Degnan. He was the cowboy by the wagon that laughed when Mark told Hazel he thought she was pretty ― Martin in The Quiet Fear. 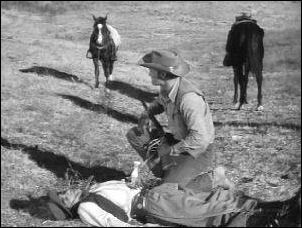 He was the cowboy who attacked Abby Striker in the barn ― The Patsy as Lafe Oberly, a member of Doke's gang. 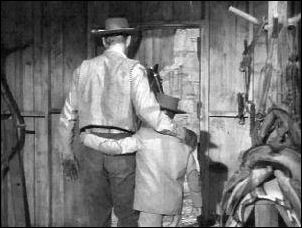 Bobby Crawford Jr. was in Eight Hours To Die as the boy who stopped by the McCain ranch to tell Lucas Mark was being kept after school — The Gaucho as Bobby, one of Mark's friend who made fun of the Gaucho ― The Second Witness as Freddy Toomey, the boy that told Mark his Pa wouldn't make it to testify against Slade Burrows. Stuart Randall appeared in two episodes ― The Gaucho as Curge Palmer, he was the man who was against Juan Argentez buying the Rumson Place ― The Grasshopper as Marshal Dixon, he was the Marshal who was taking Walt Ryerson to be hung. 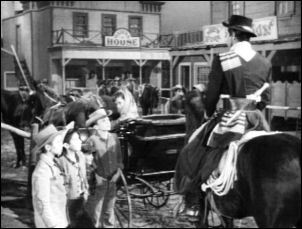 Montie Montana appeared in two episodes ― The Gaucho as one of the townsmen ― Mail Order Groom as the stagecoach driver. 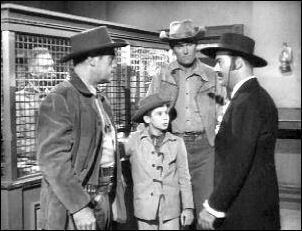 Loren Janes as the cowboy in the bank talking to Ned Dunnell and Curge Palmer. One of the key figures in the development of modern cinematic stunt design, improved safety procedures and co-founder of the Stuntmen's Association of Motion Pictures & Television. Morris Lippert as Danny (2006). He is one of the boys with Mark that was making fun of The Gaucho. Robert H. Robinson has appeared in thirteen episodes ― The Safe Guard ― Duel of Honor ― New Orleans Menace ― The Gaucho ― The Pet ― The Photographer ― The Mind Reader ― The Patsy ― Legacy ― Shotgun Man ― Day of Reckoning ― Suspicion ― Hostage to Fortune. He played a townsmen in all these episodes except one and that is Duel of Honor as as John Bradley, a passenger on the stage.